They have only one chance for survival, leave… the planet. The virus that wiped out most of the human race is adapting to defeat the vaccine and kill the survivors. There is a government response protocol but it will kill them too, it involves a nuclear winter. 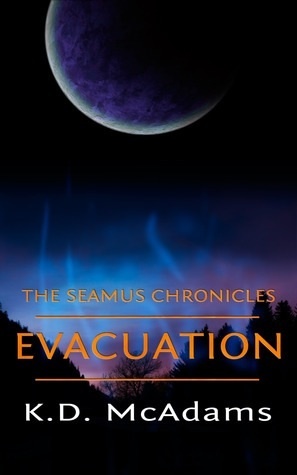 The NASA scientists believe they can leave Earth and achieve faster than light travel, but Seamus doesn’t want to slog through space. He knows that to survive they have to go somewhere fast. To save them all he needs to invent a warp drive and evacuate the planet. K. D. McAdams writes stories about young people who make choices with their heart and not their head. ‘Don’t talk to strangers’ is the most common phrase in our house, I have failed several art classes and I can’t remember what I ate for breakfast. I have a son that loves to talk to strangers, my daughter is an incredible artist and I have another son that is a stickler for details with a near eidetic memory. We nurture our kids everyday with advice and information but deep down they all have an element of nature that overrides our nurturing and influences their choices. Kids who have the courage to follow their instinct and make their own choices are the ones who make life memorable. Most of us are lucky that we don’t face life or death situations daily. Still there are times in out lives that are a big deal where we have no choice but to work with someone we don’t like. When walking away, or running, is not an option how do you deal with an annoying person and still create something good? I can remember being assigned a lab partner in high school who grated my last nerve. This person had an older sibling and every assignment brought up the fact that he should ‘Just get this from my brother.’ I would have been fine with that except it never happened. He was too cool for me, for school, for everything. There was no way I was going to let him get the ’B’ I was working towards. It happened in my first job too, and I really needed that paycheck. One of my co-workers seemed to do anything she could to annoy the rest of us. After a call she would critique us even though she consistently received the worst customer feedback. She also complained constantly about call volume and the length of calls for the team, though she rarely answered her phone. The first one hundred times I heard the word headcount it was spoken by her claiming that we needed more. These are just two of many things that made her hard to work with. In both cases I didn’t have a choice, the people in charge didn’t really care if we liked each other, I was getting compensated on results. The high school lab work didn’t go so well. Too many ‘whatever’s’ and ‘I don’t cares’ helped the two of us to a low C and a threat of no sports from my parents. Letting the person I didn’t like do all the work, or not do the work in our case, wound up punishing me twice. First I had to sit with them three times a week and second I got a crappy grade. With my early co-worker things turned out much better because of some advice I got from my boss. He said, “She just wants to feel needed. Find a way to help her and she’ll either leave you alone or start being nice to you.” Helping her turned out to be easy. She loved to run reports and roll a bunch of data into spreadsheets. Instead of arguing with her about the value of her reports, they were pointless; I spent five minutes once a week sending her my data. Blindly helping annoying people is not the answer. It’s your responsibility to know whom you have to work with and whom you can ignore. But the truth is, whether you work in corporate America, own a business or perform volunteer work you’ll have to work with others. When someone bothers you think about how you can help them and you may see some of the following benefits. If you need that grade, the paycheck or whatever and you have to work with someone you don’t like try helping them. It may wind up helping you. Do you have any tricks for working with people you don’t like?